1. Cast Iron skillet: This inexpensive classic can’t be beat. I use mine almost daily. If properly seasoned (don’t wash it with soap, dry it immediately, and rub it with a little vegetable oil on a paper towel occasionally), a cast iron skillet can also be used as a nonstick skillet. 2. Large (10 – 12 inch) stainless steel skillet (also called frying pan): This is excellent for browning or searing meats, sautéing vegetables, and making sauces. It’s my first choice for sautéing unless I need to use a nonstick skillet. 3. Large (10 – 12 inch) nonstick skillet (also called frying pan): A good nonstick skillet is vital for cooking eggs, making stir-fries, browning breaded fish or chicken fillets, or cooking anything else that may stick to regular cooking surfaces. I recently switched from Teflon coated pans that wear out after a couple of years to a more expensive but long lasting and exceedingly durable Scanpan cookware (made in Denmark) and I love it! 4. Small or medium (8 – 10 inch) nonstick skillet: Like the above, but this is great for making omelets, scrambled eggs, and other smaller and potentially sticky meals. 5. Large (6 – 12 quart) stockpot (also called pasta pot): Indispensable for making pasta, big pots of soup, boiling lots of potatoes or other vegetables, and making popcorn. 6. Medium (3 – 4 quart) stainless steel stockpot (also called saucepan): I use this beauty for steaming vegetables or rice or making small quantities of pasta. 7. Small (1 – 1 1/2 quart) saucepan: I prefer a stainless steel saucepan, which is perfect for making small amounts of sauce, single servings of soup, and for melting chocolate. 8. Dutch oven: This heavy duty pot, often made of coated cast iron, goes easily from stovetop to oven to table and can work well for making a roast, a stew or soup. 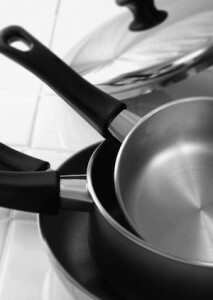 I have found that it is worth investing in good quality pots and pans that can really help get great meals on the table and don’t need to be replaced often, if ever. For help choosing great pots that will last for years, I recommend the kitchen store, Sur la Table, and/or using the product ratings and advice in Cook’s Illustrated and/or Consumer Reports. Now you have my list, but what are the pans you can’t imagine living without, or which are collecting dust and hogging space in your kitchen? Share your feedback with me and other Scramblers here or on The Scramble Facebook Page. « Tired of Cooking? How about a Lazy Picnic Dinner? My cast iron skillets; light, uncoated 1/2 sheet pans (my old, dark pans burned everything, but now I can bake/roast to perfection!) with a Silpat or parchment; muffin tins. Oh, and the recent addition…9 unglazed quarry tiles (6×6 size) that I use as a large baking stone…thank you, Home Depot! Thanks for those great suggestions, Abbie! I love my cast iron skillet and my Silpat mats, too. You can cook almost anything with 3 dutch ovens. 1 small, 1 medium and 1 large. You might want 1 large skillet, but if you want to simplify, the dutch ovens work just fine.